February 19, 2008 -- 18 years ago, the long predicted "Year of the LAN" was no longer in question -- the Local Area Network had finally arrived. A dozen years ago our book predicted "Videoconferencing should become mainstream by the end of the decade ..." How wrong! Many of us did not realize then that not only was 1996 not the year of video conferencing, but 1996 was to be the beginning of a sharp decline in video conferencing companies and prospects. But perhaps this year video conferencing has finally arrived. BT raised the possibility last year. So did Bob Metcalfe, inventor of Ethernet and predictor of the year of the LAN. The last couple of years I have re-immersed myself in video conferencing, regaining enthusiasm, re-acquiring knowledge I'd lost, and augmenting what I know of the technology and business environment. I want to highlight some pivotal pieces of history and advocate adoption of video conferencing. Video conferencing started roughly eighty years ago. "Analog", the first and longest era of video conferencing, lasted from the Herbert Hoover demonstration through the transition to digital in the 1980s. The "circuit-switched" era lasted roughly from 1986 and the early PictureTel systems, through 1996 and the beginning of the Internet "bubble". The circuit-switched era was marked both by practical and financial success, but also by short-sighted technical direction that seemingly presumed success of ISDN and ATM networking. ISDN and ATM are rarely even mentioned today, except, perhaps, in Europe and other places where ISDN telephones had some success. Many in the industry discredited the potential impact of the Internet and prepared for what they perceived as the more likely strategic inflection point: video conferencing over conventional telephone lines. With the progress of modem technology, the ITU H.324 Recommendation, Microsoft inclusion of H.324 in Windows (NetMeeting) and the beginnings of built-in microphones and cameras in PCs, this alternate scenario was plausible. In our Barriers Breaking Down chapter, we allowed that there would be many H.324 systems but demurred that they would be insufficient for "serious" videoconferencing. The industry leader, PictureTel, precipitously declined, from $490M in revenue and $32M net income in 1996, to half that revenue (exactly half, $245M) and a net loss of $(107M) four years later, the last year of PictureTel as an independent company. That year, 2000, also marked the precipitous NASDAQ decline associated with the bursting Internet bubble. In the years following 1996, typical Internet connections and backbone capacity evolved such that the biggest barrier to video conferencing, difficulties in establishing appropriate connections between conferencing systems, could be overcome. The difficulties are disappearing, especially for Internet connections, but not entirely gone. By 2001, Polycom had established new industry leadership and acquired PictureTel. It took Polycom until 2007 to recognize more revenue from video conferencing (estimated at $586M) than PictureTel achieved in 1996. In a recent interview, Polycom CEO Bob Hagerty summarized the beginning of this decade: "We were ramping very, very fast through 1999 and 2000. Cumulative average growth rates in the 30's and 40's. After 9/11 it exploded even more for us, but for really horrible reasons. Then the financial services and other industries collapsed. All of the business we received was for conference rooms which did not have people in them. The equipment was not used. ... The technology is also significantly better today. If you sell people video conferencing, they have a negative image of the way it worked in the past. It was not full duplex, the pictures would break up, and we used ISDN so you would sit there and call while all of the lines bonded. It was complex and hard. Most importantly, the user experience sucked." 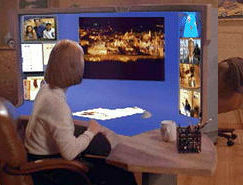 Now we are well into the "Internet" era of video conferencing. Attention has turned from the deficiencies of 5 to 15 years ago, struggling to get connected at low-res, and turned to easy to use better than TV experiences. Perhaps video conferencing will become mainstream by the end of the decade? From a conferencing perspective, the cart has been in front of the horse the last few years. Internet video has been led by YouTube et al popularization of Flash video formats (H.263, and now, H.264) designed for conferencing. I'm still overcoming my mistaken anti-Flash history -- I'll incorporate more Flash videos in future pages.